The wide range of settings makes it possible to adapt the acoustic sensor very well to the user's needs. Ambient noise is effectively filtered out. 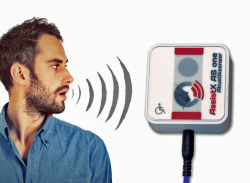 With the acoustic sensor AssistX AS one, physically disabled persons can reliably trigger a distress call, without contact and movement. The wide range of settings makes it possible to adapt the acoustic sensor very well to the user's needs. Ambient noise is effectively filtered out. #AssistX AS# one can be set to human tones of different volume, sound frequency range and duration. In addition, a special pulse mode can be set for severely impaired users. The AS one features an AssistX port and therefore can be operated with all compatible devices from the AssistX family. The AS one is self-monitoring and automatically triggers a call in case of a failure. AS one is connected to an AssistX port using the supplied cable. For example, AssistX Port, AssistX Mobil and ClickMan (newer generation) offer an AssistX port. The sensor responds to noise of a certain frequency and volume, which is maintained for a certain period of time. Optionally, a pulse mode can be set for particularly impaired users, which makes the sensor very sensitive to all noises. Only the selected volume must be reached. The pitch of the acoustic signal to trigger the sensor can be taught in. The tolerance for sensitivity and frequency as well as the duration of the sound can be adjusted. The acoustic sensor can be triggered with all sounds up to the pitch of a whistle. The most reliable triggering is achieved with a sonorous humming sound "Mmmmm". Pulse mode For heavily impaired users, who can only keep a very short sound, the acoustic sensor can be switched to the pulse mode. The sensor then responds to all noise pulses (clicking the tongue etc. ), which reach the adjusted volume. Magnetic housing base for fixing to metal strips / iron pipes or the optional wall fastening panel.